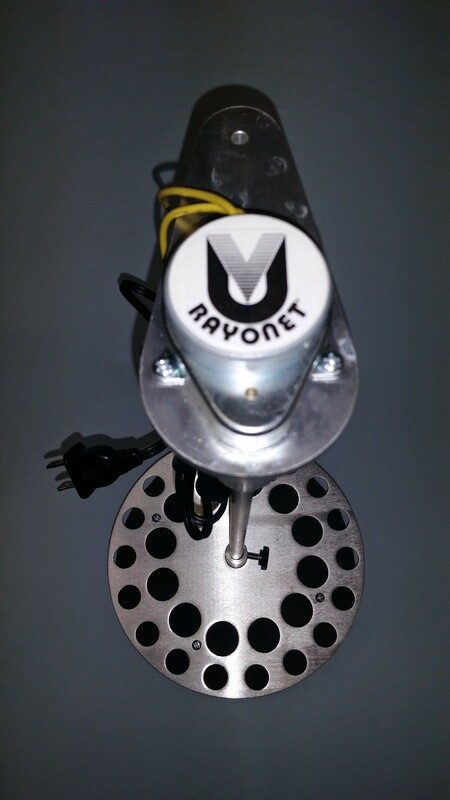 The RMA-500 Merry Go-Round unit is designed specifically for use with the Rayonet© Models RPR-100 and RPR-200. EQUAL RADIATION - The RMA-500 is designed to insure equal radiation of all samples, regardless of lamp position or intensity fluxuations. All samples are rotated past the light source at a speed of 5 RPM. MULTIPLE SAMPLE CAPACITY - The RMA-500 is supplied with one sample holder, capacity 30 samples. Motor unit can accommodate up to three holders. RELATIVE QUANTUM YIELDS - Several samples can be irritated together for the determination of Relative Yields. VERSATILE - Constant rotation speed of 5 RPM. 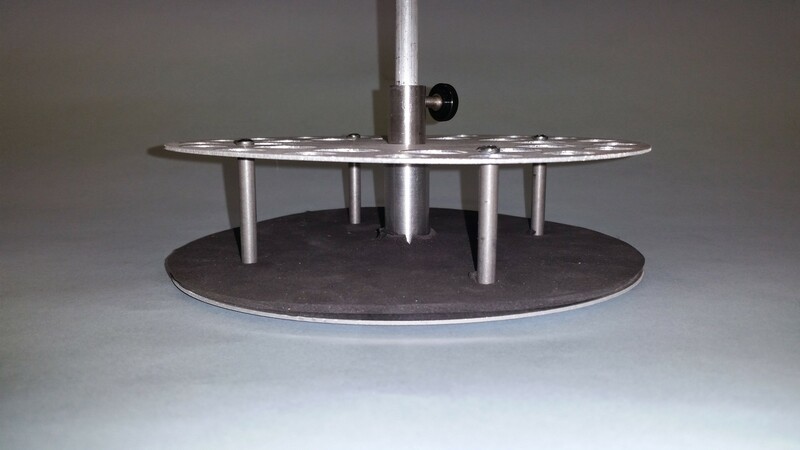 Sample wheels will accommodate reaction vessels from 3" to 11" long. Vessels up to 11/16" in diameter can be used. Quartz and Pyrex reaction vessels are available as optional equipment. This takes advantage of the high intensity of the RPR-1849A°, 2537A°, 3000A°, 3500A°, and 4190A° light sources. All samples obtain the same intensity. Different samples can be photolyzed at the same time. 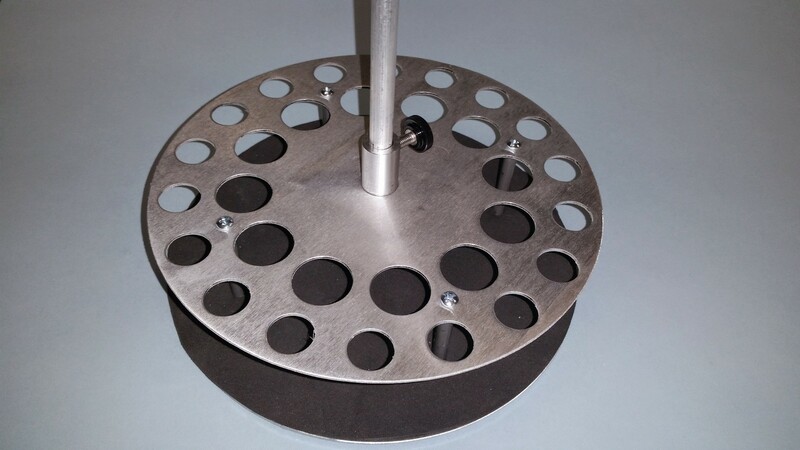 Model RMA-500 is 17" high, and 8" in diameter. Finish is anodized aluminum. It operates on 110/120v A.C. ONLY and 50/60Hz current. FOR OUR 220/240v CUSTOMERS PLEASE NOTE: If you would like to operate either this RMA-400 or the RMA-500 by your resident 220/240v power grid, you must power the RMA through a SDT-500 or you will destroy the motor on your RMA and void your warranty. As always, if you have a questions, please reach out via the contact us page.